Can you think of a better way to use “smart” technology than to potentially save lives? That’s exactly the power Nest Protect gives you – and the life it saves could be yours, or that of a family member. As important as smoke and carbon monoxide alarms are, some homes are inadequately equipped. Those systems rely on battery power alone. But when the power in those batteries diminishes, these devices designed to save us, could fail us. That’s where owing a smart device like Nest Protect comes in. 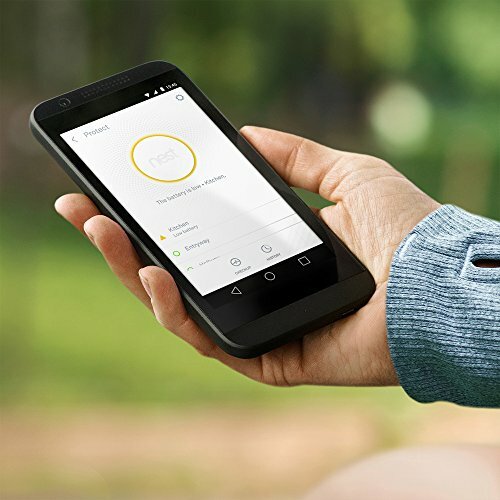 When your batteries lose power, Nest Protect sends an alert to you on your smart phone and/or tablet. It tells you what and where the problem is. It tells you if there is smoke or carbon monoxide present so you can take action immediately. Nest Protect provides the intel and protection you need – when you need it. But it won’t automatically set off an obnoxious horn that rattles your bones. Instead, you’ll receive a friendly voice alert so you can handle that burning toast, or smoking oven before the alarm sounds. Carbon monoxide is a silent killer. It’s invisible and odorless. That’s why it’s so important to have carbon monoxide detectors throughout your home. But having separate detectors for each isn’t the best option. That’s why Nest Protect combines smoke and carbon monoxide protection into one unit. And it’s smart design takes the experience of having smoke and carbon monoxide protection to a whole new level. Both wired and battery editions are quick to set up and connect to your iPhone, iPad, or Android device. Once you’re connected to Wi-Fi every Nest Protect throughout your home will automatically be connected to the others. It’s this network of protection that allows worry-free peace of mind. As a minimum, you should have at least one smoke and carbon monoxide alarm per floor. But having multiple units on each floor gives you an increased level of protection. 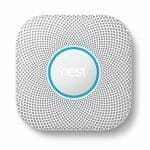 The beauty of having Nest Protect coverage is that these devices are built to spot fast burning fires, smoldering fires, and deadly carbon monoxide. It identifies where the danger is an sends out an alert you to your phone, while at the same time, triggering the other alarm systems throughout the home let anyone home know that it’s time to evacuate. The built-in multi-directional microphone ensures that the alarm voice is heard everywhere within range. The Nest Protect measures about 1 1/2 inches thick by 5.3 inches by 5.3 inches. It comes with a two-year limited manufacturer’s warranty. The manufacturer claims the carbon monoxide sensor is good for a period of 10 years. So essentially, you should get 10 years use out of your system. In addition to the connection to your phone or tablet, Nest Protect is also interconnected through its own wireless network. So even if your home’s Wi-Fi network crashes, you’re still protected as these devices can still communicate with one another. Good to know, especially if your Wi-Fi goes down frequently. Another thing that makes this a valuable safety device is that this interconnection means the Nest Protect unit nearest you at any point in time can let you know what’s happening in another area of your home. It will sound an alert first and then an emergency alarm if the issue remains. This means that when a smoke or carbon monoxide incident occurs at one location, all connected Nest Protect units sound the alert – so everyone can get out safely. But unlike a random fire alarm system where the source of the fire needs to be identified by a human, Nest Protect pinpoints the location and let you know through it’s a voice activated system. 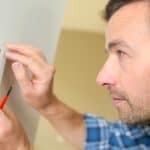 Old-school interconnected alarm systems needed to be hardwired and it was difficult and expensive to retrofit those systems. 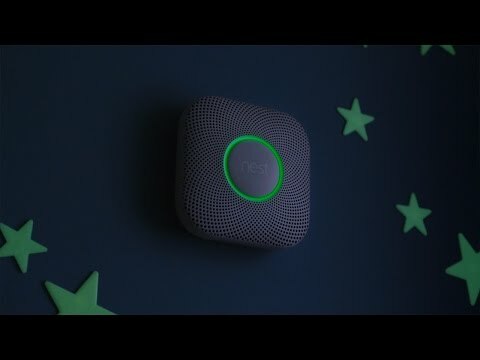 Nest Protect takes advantage of the latest technology to connect devices wirelessly, whether they are wired units or battery operated ones. How Do You Get The Most Out of Your Nest Protect System? You need to install each unit and connect it to your Wi-Fi network. You also need to set up a free Nest Protect account. That’s all you need for maximum use value. But once each unit is set up and connected, the wireless interconnect feature means that you are safe and protected at all times even when your internet connection fizzles. 1. For Nest Protect units to communicate with one another, they need to be within about 50 feet. If range is an issue, simply add an additional unit. 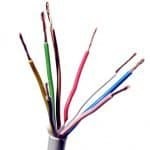 By having these intermediate units you are able to connect and tap into broader network and can easily span a home of any size. 2. 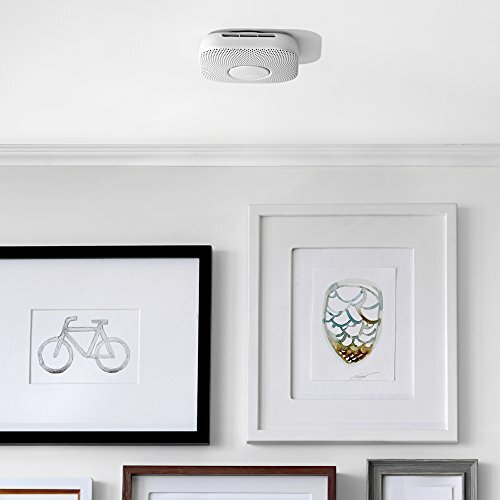 It’s also important to know that Nest Protect cannot communicate or interconnect with smoke and carbon monoxide alarms from different manufacturers. You’ve got to stick with their brand if you want to tap into the real value Nest Protect offers. 3. When setting up your system, be sure to program each unit before you install it high on the wall or ceiling. Each system needs to be contained within one building. You cannot connect units to a neighboring structure and enjoy the same level of connectivity. Most homes are single buildings. But some people have a separate building on their property they use as an office or guest home. Unfortunately, a Nest Protect smoke and carbon monoxide alarm here cannot properly connect to your primary structure’s network. Each building requires its own system of protection. 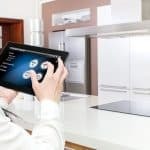 Once you’ve connected to Wi-Fi and set up each unit according to the instructions you can easily test each manually to make sure it’s functioning as it should. Also you can check the Nest App on your smart phone to ensure each individual unit shows up and is connected to the network. There are some things that can interfere with wireless signals such as heavy metal doors and multiple floors. So it’s important to test your units with both doors open and closed. If there’s interference, you may need to add an additional unit for a stronger connection. There are other things within a home that can limit the range and interrupt the connection including the number of rooms, building materials used number of floors, ductwork, large metal appliances, metal studs and suspended ceilings with metal frames. again this kind of interference can be overcome by adding additional units. You don’t have to be in your home to benefit from a Nest Protect system. For example, you could be away on vacation when the alarm system detects smoke. Instantly you’ll get an alert on your phone. Hopefully it’s nothing more than your teen son’s burnt toast – and he takes care of the situation. If those alerts go unattended however, they will occur more frequently. If the smoke gets more concentrated, the alarm will sound. With each unit costing about $100, outfitting an entire home can be on the expensive side. Figure on a cost of somewhere between $500 and $800 for most homes. That’s likely the price of maximum smoke and carbon monoxide alarm protection via a network of Nest Protect units. If you consider the cost over a 10 year period – it’s not that much for the kind of protection intelligent protection it provides. If you’ve only used “old-school” smoke detectors before you’ll love the convenience and usefulness of Nest Protect. No longer will you have to listen to those low batteries chirping away or creating random chirps when there’s some kind of the error. Instead, you’ll be notified on your smart phone when it’s time to change batteries. Less stress – easy fix. The quality of these units is significant and it’s evident from the get-go. Each Nest Protect unit features a nicely finished housing, beautiful lighting and a large button that can be used for manual testing as well as silencing nuisance alarms (you can also do this from your smart phone). Also provided is a stable mounting plate complete with holes that should fit any type of junction box. You’ll also receive a few screws with each unit for direct installation to a drywall surface. The built-in nightlight is helpful as it provides just enough light to illuminate a darkened hallway as you enter and then shuts off after you left. Imagine cooking something on the stove when it begins to smoke. Your phone you receive a notification by phone and you can quickly open the app to silence the alarm. You take action to clear the smoke and receive a notification when that smoke is cleared. How many times this is an early warning system need to fire off before your Nest Protect has paid for itself? Not many – I can tell you that. Especially if your old-school detectors are highly sensitive and blastoff at the slightest trigger. With the square design as it is, the Nest Protect can be a bit of a challenge to align perfectly so that it doesn’t look crooked and out of place. A round design would be much simpler for the do-it-yourselfer to install. Another problem overheard online (at least in the past) was a lack of customer service from the manufacturer. They often responded to negative comments with a blanket statement “contact customer support”. This lack of personalization is a turn off for most consumers considering a purchase of several hundred dollars. The Nest Protect system offers a level of protection virtually every home could benefit from. At the first sign of an issue, it calmly and reliably alerts you to the potential danger – both when you’re home and away – before sounding the loud alarm. This gives you time to react accordingly – without a wailing alarm. But the alarm is there and ready to respond whenever it’s needed. Essentially, what the Nest Protect offers is convenience and smart safety management in one. Oh and… chances are you’ll never have to worry about a malfunction. The system conducts its own self-test every 200 seconds, in addition to performing a sound check every month. The colored status lights also indicate that your Nest Protect is functioning as it should. For peace of mind and maximum fire and carbon monoxide protection – we recommend this product. The Nest protect is a good Smart Home product, mine ran out of batteries recently and let us know politely for a while before I decided to change them out. I’m surprised that the Nest ecosystem isn’t fleshing out a bit quicker, there are a multitude of devices required in the modern home.